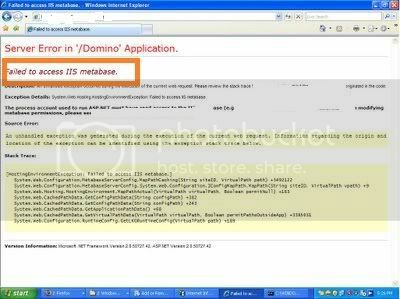 After installing IIS server when you browsing Asp.net web site or an asp.net aspx page in IIS server then you may getting or encounter an error named "Failed to access IIS metabase". System.Web.Hosting.HostingEnvironmentException: Failed to access IIS metabase. you may have installed IIS Server after installing the .NET framework. Step 6: Change the path based on your local path. Step 7: Wait a few moment until a message comes Successfully Register. Note: If you multiple .net version like Asp.net 1.1,Asp.net 2.0 or Asp.net 3.5 then modify the above command accordingly & run.